Your onboarding process is critical to customer success. Reduce time to value and drive better results with this customer onboarding template. What are the customer's main objectives and ideal outcomes? How does our product help? What challenges does it solve for them? Outline your process for achieving these primary goals. Include actionable steps toward time to first value and milestones afterward. The process should lead back to and align with their ideal outcomes as closely as possible. What features, processes, or aspects of your product does the client need to understand during the customer onboarding process? How can we make this as simple and stress-free as can be? Set expectations for each step of the customer onboarding process. Are there any potential setbacks or sticky points the client should be aware of? How will our team help? Introduce or brief the client on key team members they may interact with during their customer onboarding journey. Who can they reach out to with questions or concerns? Did any issues or concerns arise during the customer onboarding meeting that could jeopardize engagement or retention? How can we mitigate these risks? Were any opportunities to increase spend or engagement identified during the initial customer onboarding meeting? Create a list of takeaways for both your team and the customer. Assign actionable steps to your team. Share key information and implementation process with the customer. How will we keep the customer in the loop? Should we schedule a check-in? Whether you're a low-touch SaaS startup or a high-touch enterprise, onboarding is critical to customer success. It determines whether you'll drive retention or plant the seeds of churn—and the effects ripple throughout your entire business. Streamline true customer success with our versatile customer onboarding template. This meeting note template provides a simple yet powerful way to get your customers to their "aha" moment. Through adaptability, alignment, and accountability, our outline connects your customer to the unique value of your product as well as your team. Each client is different. Personalize this customer onboarding template to suit their specific needs. By tailoring this outline to be as simple or as detailed as needed, you can set the right tone, keep the client engaged, and make the customer onboarding process more enjoyable. 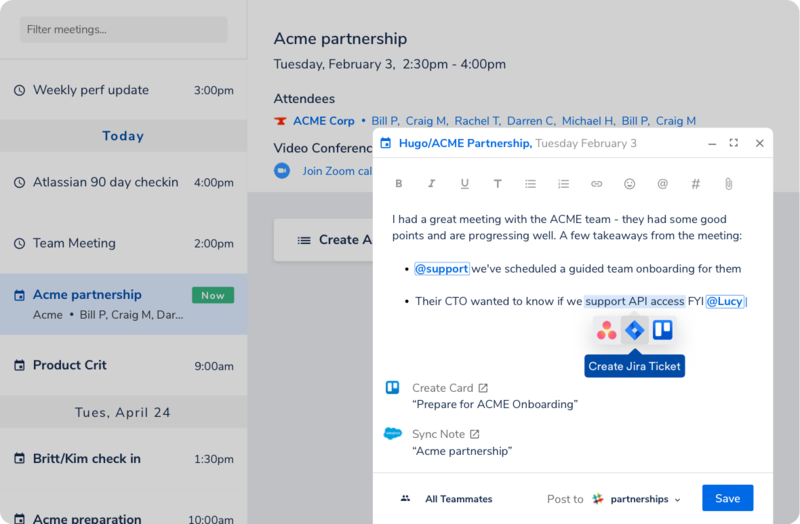 With centralization and sharing capabilities, this meeting note template allows your whole team to be aligned on the customer's needs and pain points without having to attend the onboarding meeting. This unparalleled insight yields a deeper understanding of the customer's goals—and how to achieve them. When everyone's on the same page, it's much easier to establish trust, build customer loyalty, and ensure retention. Last but certainly not least, our customer onboarding template validates your customer's "aha" moment through action and accountability. With seamless integration into your team's favorite tools, they can visualize the puzzle pieces needed to make a complete picture of success for your customer. They can then implement these steps by making them actionable and assignable. Don't just get things off the ground. Launch at light speed. Power your workflow, reduce time to first value, and drive more meaningful results with this meeting note template right now.